In 1982, Richard Clauson and Dr Paul John, were RAC/ACU instructors for the Chelmsford Motorcycle Training Scheme when Sergeant Roger Anderson (later Chief Inspector (Traffic) in charge of 200 + Traffic Officers with Essex Traffic Police) turned up to see if there was anything he could do to help. Seeing they were providing good training for ‘learners’, Roger realised there was no ‘further’ training available for Essex riders who held a full licence, so they decided to do something about it. An advertisement was placed in MCN to see if there was any interest in forming a local group. Uncertain how many would turn up, they booked a small room at The Generals Arms pub in Little Baddow. Sincere apologies had to be given to those who had to stand throughout the first meeting; the response was fantastic confirming there was a very real demand for a group like EAMG. Seventy-five people completed membership forms, eighteen being full IAM Members (car and bike) and sixty-four bikes filled the car park. EAMG was born, only the second IAM Bike Group in the UK, after Kent AMG. 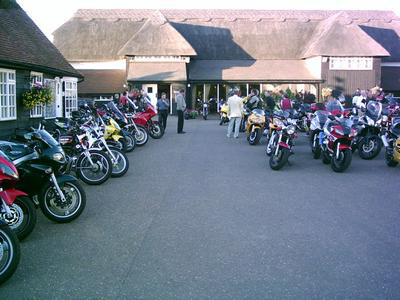 Growing membership called for a new venue so the Group moved to The White Hart (Boreham) but this was short lived. Sergeant Roger had heard about ‘exclusive’ Channels so he put on his best uniform and went in the “company car” to meet the Secretary. He said he represented an Institute of Advanced Motorists group who’d like to hold their meetings there. In his words, “I didn’t tell any lies, I just didn’t tell them we were motorcyclists”!!! We’ve been made to feel most welcome ever since. Current Manager, Dave, amusingly, recalls seeing “so many bikes in the car park on Group nights that those arriving first couldn’t get their bikes out if they wanted to leave early”. 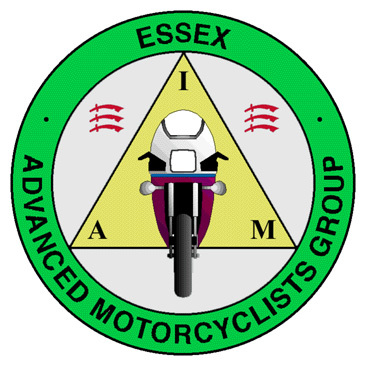 EAMG Membership continued to grow reaching well in excess of 400; the number of IAM Motorcycle groups also increased resulting in a gradual IAM restructure away from the ‘car group’ approach. Highly qualified Police Class 1 riders held the position of EAMG Chairman for all but two of the Group’s first eighteen years affiliation to the IAM so it was inevitable there would be differences of opinion. Passing the IAM’s ‘Advanced Motorcycle Test’, a ‘Skill for Life’, is a very good achievement but it’s only a measure of the standard achieved on test day. Nothing was available for EAMG Members to ensure this standard is maintained or improved. IAM groups repeatedly asked for a graded test pass and continuing assessment but requests were ignored. In 1999, having investigated co-affiliation with RoSPA, the IAM took the decision to suspend the membership of Paul Roberts, our Chairman and threatened to suspend EAMG’s entire Committee. “Pursuit of the RoSPA Test is not something in which EAMG can be involved!” IAM. The burning desire of EAMG Members to achieve more following an IAM Test didn’t abate; becoming ever more despondent, some Members even deciding to leave the Group. This untenable situation could not be allowed to continue. With independence came enormous responsibilities. We had to rebrand our Group, re-write our training manual, all our administration procedures, our documentation, design a new and refreshing logo and rebuild our reputation as the best training group in Essex. George Brown, Chris Reed, Steve Shortis and John Tipper collectively wrote ‘EAMG Training’, the Group’s training manual, taking account of changes in best riding and best instructional practice and drawing on the collective knowledge and experience of former Observers and Members holding a Police Class 1 qualification. Thirteen years on, our new website and new logo verifies the continued success of EAMG. The commendable report given by the Kent Police Class 1 Motorcyclist on the recent SOA riding assessment (see Training) is testament to the riding standard required of our Observers, crucial if Group standards are to be maintained. Why wait? Come and join us?